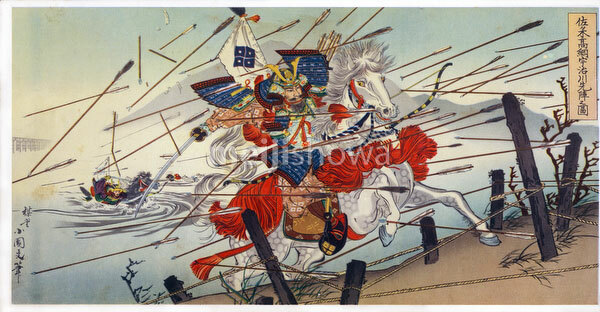 History print showing Sasaki Takatsuna (佐々木高綱, 1160–1214) at the 1184 Battle of Uji. Sasaki Takatsuna was a Japanese samurai commander in the Genpei War (1180–1185), a conflict between the Taira and Minamoto clans. Title of print: Sasaki Takatsuna Ujigawa Senjin no Zu.